Spain (Spanish : España [esˈpaɲa] ( listen )), officially the Kingdom of Spain  (Spanish: Reino de España), [lower-alpha 1] [lower-alpha 2] is a country mostly located in Europe. 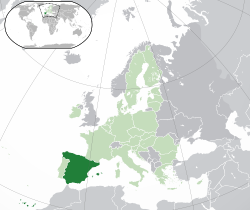 Its continental European territory is situated on the Iberian Peninsula. Its territory also includes two archipelagoes: the Canary Islands off the coast of Africa, and the Balearic Islands in the Mediterranean Sea. The African enclaves of Ceuta, Melilla, and Peñón de Vélez de la Gomera  make Spain the only European country to have a physical border with an African country (Morocco). 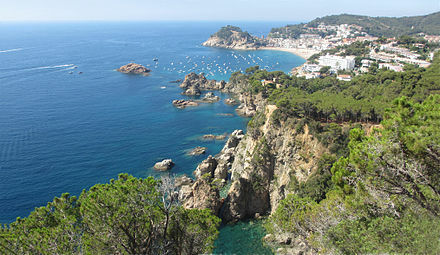 [lower-alpha 8] Several small islands in the Alboran Sea are also part of Spanish territory. 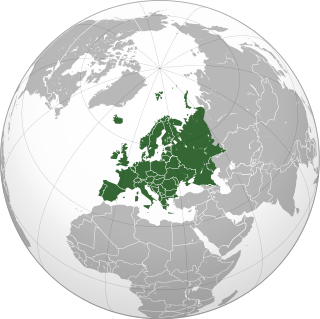 The country's mainland is bordered to the south and east by the Mediterranean Sea except for a small land boundary with Gibraltar; to the north and northeast by France, Andorra, and the Bay of Biscay; and to the west and northwest by Portugal and the Atlantic Ocean. This is a list of countries and territories in Europe by population density. Modern humans first arrived in the Iberian Peninsula around 35,000 years ago. Iberian cultures along with ancient Phoenician, Greek, Celtic and Carthaginian settlements developed on the peninsula until it came under Roman rule around 200 BCE, after which the region was named Hispania , based on the earlier Phoenician name Sp(a)n or Spania. At the end of the Western Roman Empire the Germanic tribal confederations migrated from Central Europe, invaded the Iberian peninsula and established relatively independent realms in its western provinces, including the Suebi, Alans and Vandals. Eventually, the Visigoths would forcibly integrate all remaining independent territories in the peninsula, including Byzantine provinces, into the Kingdom of Toledo, which more or less unified politically, ecclesiastically and legally all the former Roman provinces or successor kingdoms of what was then documented as Hispania. In the early modern period, Spain became the world's first global empire and the most powerful country in the world, leaving a large cultural and linguistic legacy that includes +570 million Hispanophones,  making Spanish the world's second-most spoken native language, after Mandarin Chinese. During the Golden Age there were also many advancements in the arts, with world-famous painters such as Diego Velázquez. 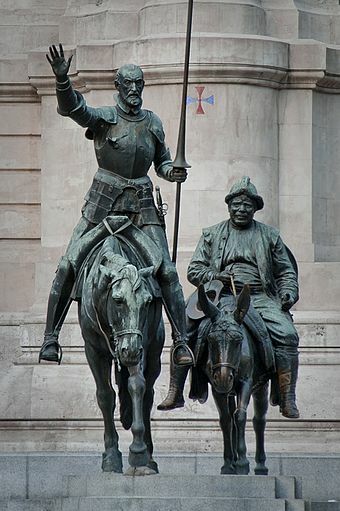 The most famous Spanish literary work, Don Quixote , was also published during the Golden Age. Spain hosts the world's third-largest number of UNESCO World Heritage Sites. Hispanophone and Hispanosphere are terms used to refer to Spanish-language speakers and the Spanish-speaking world, respectively. The terms derive from the Latin political name of the Iberian Peninsula, Hispania. In addition to the general definition of Hispanophone, some groups in the Hispanic world make a distinction between Castilian-speaking and Spanish-speaking, with the former term denoting the speakers of the Spanish language—also known as Castilian—and the latter the speakers of the Spanish or Hispanic languages. 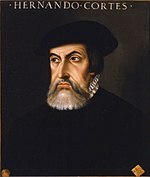 The Renaissance scholar Antonio de Nebrija proposed that the word Hispania evolved from the Iberian word Hispalis , meaning "city of the western world". Archaeological research at Atapuerca indicates the Iberian Peninsula was populated by hominids 1.2 million years ago. In Atapuerca fossils have been found of the earliest known hominins in Europe, the Homo antecessor. Modern humans first arrived in Iberia, from the north on foot, about 35,000 years ago. [ not in citation given ] The best known artefacts of these prehistoric human settlements are the famous paintings in the Altamira cave of Cantabria in northern Iberia, which were created from 35,600 to 13,500 BCE by Cro-Magnon. 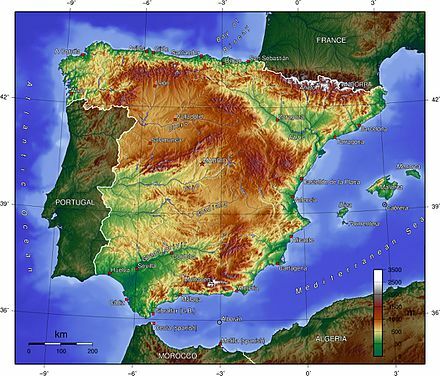 Archaeological and genetic evidence suggests that the Iberian Peninsula acted as one of several major refugia from which northern Europe was repopulated following the end of the last ice age. The state as established under Franco was nominally neutral in the Second World War, although sympathetic to the Axis. 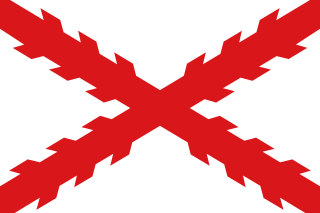 The only legal party under Franco's post civil war regime was the Falange Española Tradicionalista y de las JONS, formed in 1937; the party emphasised falangism, a form of fascism that emphasised anti-communism, nationalism and Roman Catholicism. 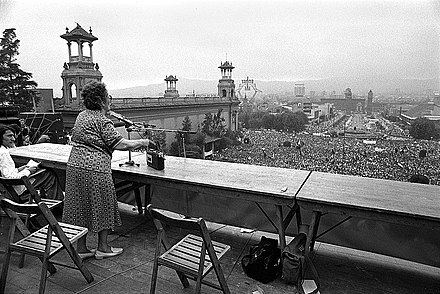 Given Franco's opposition to competing political parties, the party was renamed the National Movement ( Movimiento Nacional ) in 1949. 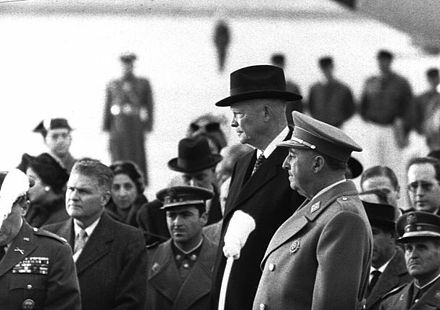 After World War II Spain was politically and economically isolated, and was kept out of the United Nations. This changed in 1955, during the Cold War period, when it became strategically important for the US to establish a military presence on the Iberian Peninsula as a counter to any possible move by the Soviet Union into the Mediterranean basin. In the 1960s, Spain registered an unprecedented rate of economic growth which was propelled by industrialisation, a mass internal migration from rural areas to Madrid, Barcelona and the Basque Country and the creation of a mass tourism industry. Franco's rule was also characterised by authoritarianism, promotion of a unitary national identity, the favouring of a very conservative form of Roman Catholicism known as National Catholicism, and discriminatory language policies. 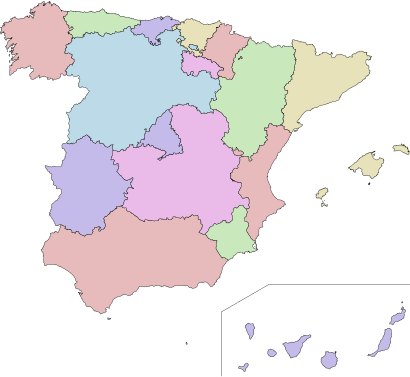 Spain is organisationally structured as a so-called Estado de las Autonomías ("State of Autonomies"); it is one of the most decentralised countries in Europe, along with Switzerland, Germany and Belgium;  for example, all autonomous communities have their own elected parliaments, governments, public administrations, budgets, and resources. Health and education systems among others are managed by the Spanish communities, and in addition, the Basque Country and Navarre also manage their own public finances based on foral provisions. In Catalonia, the Basque Country, Navarre and the Canary Islands, a full-fledged autonomous police corps replaces some of the State police functions (see Mossos d'Esquadra , Ertzaintza , Policía Foral/Foruzaingoa and Policía Canaria ). Spain's autonomous communities are the first level administrative divisions of the country. 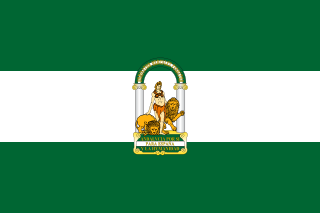 They were created after the current constitution came into effect (in 1978) in recognition of the right to self-government of the "nationalities and regions of Spain". The autonomous communities were to comprise adjacent provinces with common historical, cultural, and economical traits. This territorial organisation, based on devolution, is literally known in Spain as the "State of Autonomies". The Spanish Constitution of 1978, in its second article, recognises several contemporary entities— nationalities — [lower-alpha 13] and regions, within the context of the Spanish nation. The arrival of the gitanos , a Romani people, began in the 16th century; estimates of the Spanish Roma population range from 750,000 to over one million. There are also the mercheros (also quinquis), a formerly nomadic minority group. Their origin is unclear. The health care system of Spain (Spanish National Health System) is considered one of the best in the world, in 7th position in the ranking elaborated by the World Health Organization. The health care is public, universal and free for any legal citizen of Spain. The total health spending is 9.4% of the GDP, slightly above the average of 9.3% of the OECD. Other major plays from the medieval times were Mester de Juglaría , Mester de Clerecía , Coplas por la muerte de su padre or El Libro de buen amor (The Book of Good Love). During the Renaissance the major plays are La Celestina and El Lazarillo de Tormes , while many religious literature was created with poets as Luis de León, San Juan de la Cruz, Santa Teresa de Jesús, etc. During the Golden Age we find painters such as El Greco, José de Ribera, Bartolomé Esteban Murillo and Francisco Zurbarán. Also inside Baroque period Diego Velázquez created some of the most famous Spanish portraits, like Las Meninas or Las Hilanderas . Spanish cinema has achieved major international success including Oscars for recent films such as Pan's Labyrinth and Volver . In the long history of Spanish cinema, the great filmmaker Luis Buñuel was the first to achieve world recognition, followed by Pedro Almodóvar in the 1980s (La Movida Madrileña). Mario Camus and Pilar Miró worked together in Curro Jiménez. The most popular traditional musical instrument, the guitar, originated in Spain. Typical of the north are the traditional bag pipers or gaiteros , mainly in Asturias and Galicia. Inner Spain – Castile – hot, thick soups such as the bread and garlic-based Castilian soup, along with substantious stews such as cocido madrileño . Food is traditionally conserved by salting, like Spanish ham, or immersed in olive oil, like Manchego cheese. Atlantic Spain – the whole Northern coast, including Asturian, Basque, Cantabrian and Galician cuisine – vegetable and fish-based stews like caldo gallego and marmitako . Also, the lightly cured lacón ham. The best known cuisine of the northern countries often rely on ocean seafood, like the Basque-style cod, albacore or anchovy or the Galician octopus-based polbo á feira and shellfish dishes. Public holidays celebrated in Spain include a mix of religious (Roman Catholic), national and regional observances. Each municipality is allowed to declare a maximum of 14 public holidays per year; up to nine of these are chosen by the national government and at least two are chosen locally. Spain's National Day ( Fiesta Nacional de España ) is 12 October, the anniversary of the Discovery of America and commemorate Our Lady of the Pillar feast, patroness of Aragon and throughout Spain. ↑ The official Spanish language of the State is established in the Section 3 of the Spanish Constitution of 1978 to be Castilian. In some autonomous communities, Catalan 20%, Galician 5% and Basque 2% are co-official languages. Aragonese, Asturian, and Occitan (locally known as Aranese) have some degree of official recognition. ↑ See list of transcontinental countries. ↑ The latifundia (sing., latifundium), large estates controlled by the aristocracy, were superimposed on the existing Iberian landholding system. ↑ The poets Martial, Quintilian and Lucan were also born in Hispania. ↑ The Berbers soon gave up attempting to settle the harsh lands in the north of the Meseta Central (Inner Plateau) handed to them by the Arab rulers. ↑ For the related expulsions that followed see Morisco. ↑ The term "nationality" was chosen carefully in order to avoid the more politically charged term "nation", however in recent years it has been proposed to use this term in the Constitution and officially recognise Spain as a plurinational state ("nation of nations"). 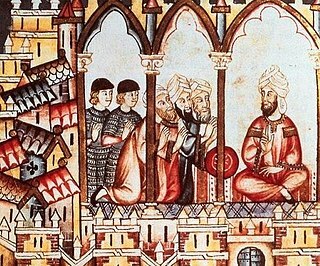 Moriscos were former Muslims and their descendants who were pressured heavily by the Catholic church and the Spanish Crown under the threat of death to convert to Christianity after Spain outlawed the open practice of Islam by its sizeable Muslim population in the early 16th century. Iberian federalism, Pan-Iberism or simply Iberism are the names for the pan-nationalist ideology supporting the federation of all the territories of the Iberian Peninsula. Catholic Christianity is the largest religion in Spain, but practical secularization is strong. Only 3% of Spaniards consider religion as one of their three most important values, even lower than the 5% European average. The Spanish Constitution of 1978 abolished Catholicism as the official state religion, while recognizing the role it plays in Spanish society. As a result, there is no official religion and religious freedom is protected. The Catalans are an Iberian/European ethnic group of mediterranean and Pyrenean descent, having its roots in the Pyrenees mountains. The only official category of "Catalans" is that of the citizens of Catalonia, an autonomous community in Spain and the inhabitants of the Roussillon historical region in southeast France, today the Pyrénées Orientales departments, also called Catalonia Nord and Pays Catalan in French. The Principality of Catalonia was a medieval and early modern political entity in the northeastern Iberian Peninsula. During most of its history it was in dynastic union with the Kingdom of Aragon, constituting together the Crown of Aragon. Between the 13th and the 18th centuries it was bordered by the Kingdom of Aragon to the west, the Kingdom of Valencia to the south, the Kingdom of France and the feudal lordship of Andorra to the north and by the Mediterranean sea to the east. 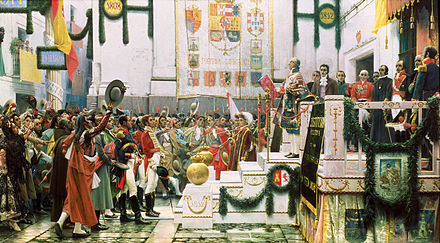 The term "Principality of Catalonia" remained in use until the Second Spanish Republic, when its use declined because of its historical relation to the monarchy. Today, the term Principat (Principality) is used primarily to refer to the autonomous community of Catalonia in Spain, as distinct from the other Catalan Countries. and usually including the historical region of Roussillon in southern France. 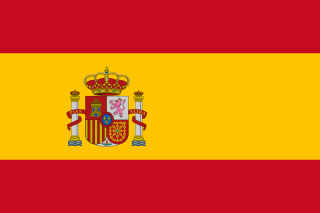 The languages of Spain, or Spanish languages, are the languages spoken or once spoken in Spain. Romance languages are the most widely spoken in Spain; of which Spanish, or Castilian, is the only language which has official status for the whole country. Various other languages have co-official or recognised status in specific territories, and a number of unofficial languages and dialects are spoken in certain localities. Islam was a widespread religion in what is now Spain and Portugal for nine centuries, beginning with the Umayyad conquest of Hispania and ending with its prohibition by the modern Spanish state in the mid-16th century and the expulsion of the Moriscos in the early 17th century. Although a significant proportion of Moriscos returned to Spain or avoided expulsion through various means, and the decree never affected the country's large enslaved Muslim population, the peacefull practice of Islam had faded into obscurity by the 19th century. Spanish nationalism is the nationalism that asserts that the Spaniards are a nation, and promotes the cultural unity of the Spanish. In a general sense, it comprises political and social movements inspired by a love for Spanish culture, language, history, and a sense of pride in Spain and its people. 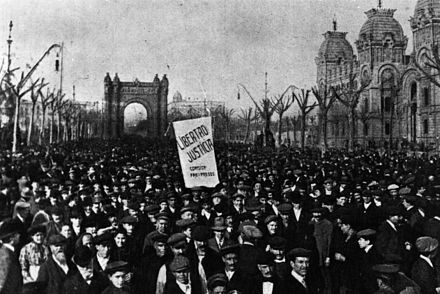 Spanish nationalists often reject other nationalist movements within Spain, specifically Catalan and Basque nationalism. Other forms of Spanish nationalism have included pan-Iberianism and pan-Hispanism. ↑ "Acuerdo entre el Reino de España y Nueva Zelanda sobre participación en determinadas elecciones de los nacionales de cada país residentes en el territorio del otro, hecho en Wellington el 23 de junio de 2009". Noticias Jurídicas. ↑ Presidency of the Government (11 October 1997). "Real Decreto 1560/1997, de 10 de octubre, por el que se regula el Himno Nacional" (PDF). Boletín Oficial del Estado núm. 244 (in Spanish). Archived (PDF) from the original on 24 September 2015. ↑ "Anuario estadístico de España 2008. 1ª parte: entorno físico y medio ambiente" (PDF). Instituto Nacional de Estadística (Spain). Archived (PDF) from the original on 24 September 2015. Retrieved 14 April 2015. ↑ "Population Figures at 01 July 2018. Migrations Statistics. First half of 2018" (PDF) (in Spanish). National Statistics Institute (INE). 13 December 2018. Archived from the original on 28 June 2017. ↑ "2016 Human Development Report" (PDF). United Nations Development Programme. 2016. Archived (PDF) from the original on 22 March 2017. Retrieved 23 March 2017. ↑ News, Morocco World (2012-08-29). "Spanish Military Arrest Four Moroccans after they Tried to Hoist Moroccan Flag in Badis Island". Morocco World News. Retrieved 2019-03-17. 1 2 "Iberia vs Hispania: Origen etimológico". Archived from the original on 27 December 2016. ↑ Esparza, José Javier (2007). La gesta española : historia de España en 48 estampas, para quienes han olvidado cuál era su nación (1a. ed.). Barcelona: Áltera. ISBN 978-84-96840-14-0. ↑ "La Constitución española de 1978. Título preliminar" (in Spanish). Página oficial del Congreso de los Diputados. Archived from the original on 27 October 2017. Retrieved 30 September 2017. ↑ Whitehouse, Mark (6 November 2010). "Number of the Week: $10.2 Trillion in Global Borrowing". The Wall Street Journal. Archived from the original on 20 September 2017. ↑ Henley, Peter H.; Blokker, Niels M. "The Group of 20: A Short Legal Anatomy" (PDF). Melbourne Journal of International Law. 14: 568. Retrieved 23 October 2018. Spain’s peculiar but seemingly secure position within the G20 also appears to have facilitated their greater participation in the G20’s work: Spain is the only outreach participant to have made policy commitments comparable to those of G20 members proper at summits since Seoul. Spain therefore appears to have become a de facto member of the G20. ↑ ABC. ""I-span-ya", el misterioso origen de la palabra España". Archived from the original on 13 November 2016. ↑ Burke, Ulick Ralph (1895). A History of Spain from the Earliest Times to the Death of Ferdinand the Catholic, Volume 1. London: Longmans, Green & Co. p. 12. ↑ Herbermann, Charles, ed. (1913). "Spain" . Catholic Encyclopedia . New York: Robert Appleton Company. ↑ "Rabbits, fish and mice, but no rock hyrax". Understanding Animal Research. 1 2 Anthon, Charles (1850). A system of ancient and mediæval geography for the use of schools and colleges. New York: Harper & Brothers. p. 14. ↑ "'First west Europe tooth' found". BBC. 30 June 2007. Archived from the original on 1 November 2009. Retrieved 9 August 2008. 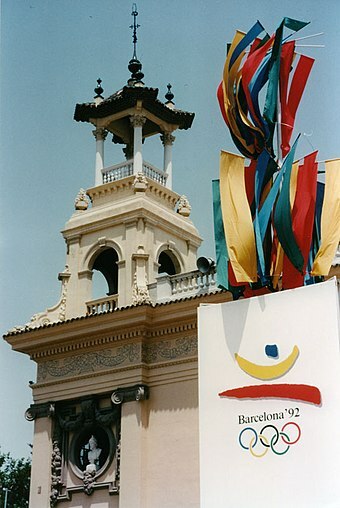 ↑ Bernaldo de Quirós Guidolti, Federico; Cabrera Valdés, Victoria (1994). "Cronología del arte paleolítico" (PDF). Complutum. 5: 265–276. ISSN 1131-6993 . Retrieved 17 November 2012. 1 2 Payne, Stanley G. (1973). "A History of Spain and Portugal; Ch. 1 Ancient Hispania". The Library of Iberian Resources Online. Retrieved 9 August 2008. 1 2 Rinehart, Robert; Seeley, Jo Ann Browning (1998). "A Country Study: Spain. Chapter 1 – Hispania". Library of Congress Country Series. Archived from the original on 22 September 2008. Retrieved 9 August 2008. 1 2 3 Herbermann, Charles, ed. (1913). "Spain" . Catholic Encyclopedia . New York: Robert Appleton Company. ↑ A History of Portugal and the Portuguese Empire: Volume 1, Portugal: From Beginnings to 1807. Cambridge University Press. 2009. ISBN 978-1-107-71764-0. ↑ Marcolongo, Andrea (2017). La lengua de los dioses: Nueve razones para amar el griego (in Greek). Penguin Random House Grupo Editorial España. ISBN 978-84-306-1887-3. ↑ H. Patrick Glenn (2007). Legal Traditions of the World. Oxford University Press. pp. 218–219. Dhimma provides rights of residence in return for taxes. ↑ Lewis, Bernard (1984). The Jews of Islam. Princeton: Princeton University Press. p. 62. ISBN 978-0-691-00807-3. Dhimmi have fewer legal and social rights than Muslims, but more rights than other non-Muslims. 1 2 3 4 Payne, Stanley G. (1973). "A History of Spain and Portugal; Ch. 2 Al-Andalus". The Library of Iberian Resources Online. Retrieved 9 August 2008. ↑ Moa, Pío (2010). Nueva historia de España : de la II Guerra Púnica al siglo XXI (1. ed.). Madrid: Esfera de los Libros. ISBN 978-84-9734-952-9. ↑ Handbook of Medieval Culture, Volume 1. ↑ Rinehart, Robert; Seeley, Jo Ann Browning (1998). "A Country Study: Spain – Castile and Aragon". Library of Congress Country Series. Retrieved 9 August 2008. ↑ "Catholic Encyclopedia: Isabella I". Newadvent.org. 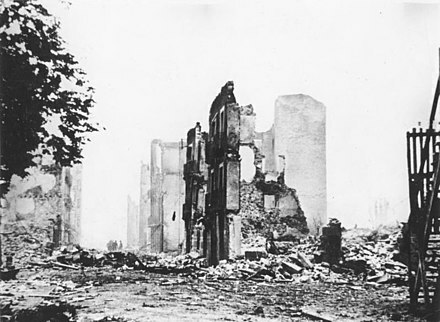 1 October 1910. Archived from the original on 7 July 2014. Retrieved 1 March 2014. ↑ "BBC – Religions – Islam: Muslim Spain (711–1492)". Archived from the original on 27 February 2017. ↑ "Islamic History". Archived from the original on 12 March 2016. ↑ "Europe & the Islamic Mediterranean AD 700–1600". Archived from the original on 6 March 2016. ↑ Payne, Stanley G. (1973). "A History of Spain and Portugal; Ch. 5 The Rise of Aragon-Catalonia". The Library of Iberian Resources Online. Retrieved 9 August 2008. ↑ "The Black Death". Channel 4. Archived from the original on 9 July 2008. Retrieved 13 August 2008. ↑ Codex Judaica: Chronological Index of Jewish History, Covering 5,764 Years of Biblical, Talmudic & Post-Talmudic History. ↑ Why Me God: A Jewish Guide for Coping and Suffering. ↑ Encyclopedia of Diasporas: Immigrant and Refugee Cultures Around the World. Volume I: Overviews and Topics; Volume II: Diaspora Communities. ↑ The Christian Church from the 1st to the 20th Century. ↑ The Routledge Atlas of Jewish History. 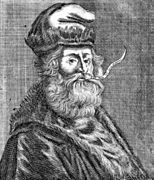 ↑ Anti-Jewish Riots in the Crown of Aragon and the Royal Response, 1391–1392. Cambridge University Press. 2016. p. 19. ISBN 978-1-107-16451-2. 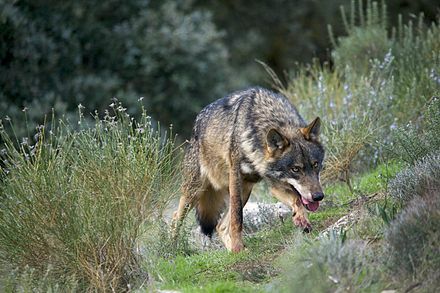 ↑ "Spanish Inquisition left genetic legacy in Iberia". New Scientist. 4 December 2008. Archived from the original on 28 March 2014. Retrieved 18 January 2014. ↑ The Kingfisher History Encyclopedia. p. 201. ISBN 978-0-7534-5784-9. ↑ True Jew: Challenging the Stereotype. ↑ The Expulsion of the Jews: Five Hundred Years of Exodus. ↑ "The Treaty of Granada, 1492". Islamic Civilisation. Archived from the original on 24 September 2008. Retrieved 13 August 2008. 1 2 Rinehart, Robert; Seeley, Jo Ann Browning (1998). "A Country Study: Spain – The Golden Age". Library of Congress Country Series. Archived from the original on 9 August 2008. Retrieved 9 August 2008. 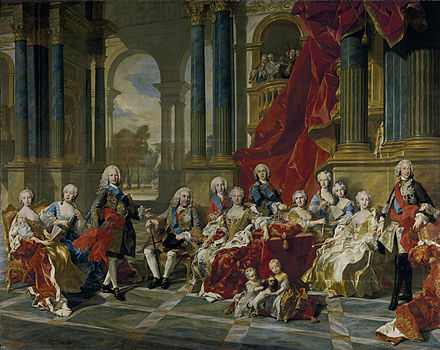 ↑ Spanish Royal Patronage 1412–1804: Portraits as Propaganda. Cambridge Scholars Publishing. 2018. p. 111. ISBN 978-1-5275-1229-0. ↑ Notes On Entering Deen Completely: Islam as its followers know it. ↑ We are All Moors: Ending Centuries of Crusades Against Muslims and Other Minorities. ↑ The Spanish Empire: A Historical Encyclopedia [2 volumes]: A Historical Encyclopedia. ABC-CLIO. 2016. p. 221. ISBN 978-1-61069-422-3. 1 2 Naimark, Norman (2016). Genocide: A World History. p. 35. ↑ Daniel George Edward Hall (1981). History of South-East Asia. Macmillan Press. p. 282. ISBN 978-0-333-24163-9. ↑ "Imperial Spain". University of Calgary. Archived from the original on 29 June 2008. Retrieved 13 August 2008. ↑ Handbook of European History. Penguin Random House Grupo Editorial España. 1994. ISBN 90-04-09760-0. ↑ Thomas, Hugh (2003). Rivers of gold: the rise of the Spanish Empire. London: George Weidenfeld & Nicolson. pp. passim. ISBN 978-0-297-64563-4. ↑ "The Seventeenth-Century Decline". The Library of Iberian resources online. Archived from the original on 21 September 2013. Retrieved 13 August 2008. ↑ Payne, Stanley G. (1973). "A History of Spain and Portugal; Ch. 14 Spanish Society and Economics in the Imperial Age". The Library of Iberian Resources Online. Retrieved 9 August 2008. ↑ Rinehart, Robert; Seeley, Jo Ann Browning (1998). 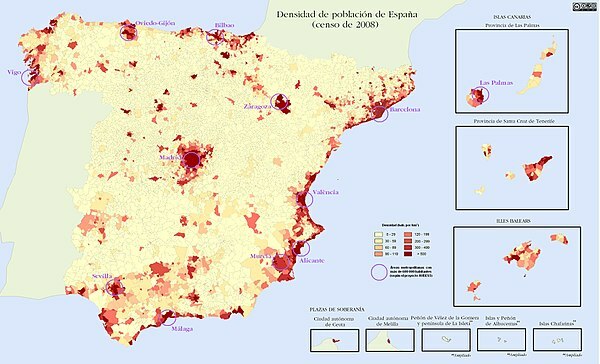 "A Country Study: Spain – Spain in Decline". Library of Congress Country Series. Archived from the original on 9 August 2008. Retrieved 9 August 2008. ↑ Rinehart, Robert; Seeley, Jo Ann Browning (1998). "A Country Study: Spain – Bourbon Spain". Library of Congress Country Series. Archived from the original on 9 August 2008. Retrieved 9 August 2008. ↑ Rodríguez. Independence of Spanish America. Cambridge University Press. citation: "It met as one body, and its members represented the entire Spanish world"
↑ "Relatives of Spaniards who fled Franco granted citizenship". The Daily Telegraph. London. 28 December 2008. Archived from the original on 23 July 2013. Retrieved 18 January 2014. ↑ "El contubernio que preparó la democracia". EL PAÍS. Archived from the original on 5 April 2013. ↑ "Contubernio de Múnich: 50 años". Archived from the original on 21 October 2014. ↑ "El contubernio de Munich". La Vanguardia. ↑ "Speech by Mrs Nicole FONTAINE, President of the European Parliament on the occasion of the presentation of the Sakharov Prize 2000 to Basta ya!". Archived from the original on 2 October 2016. ↑ Pfanner, Eric (11 July 2002). 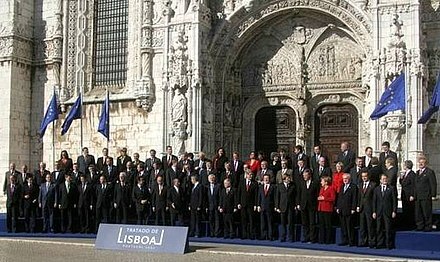 "Economy reaps benefits of entry to the 'club' : Spain's euro bonanza". International Herald Tribune. Archived from the original on 1 May 2011. Retrieved 9 August 2008. See also: "Spain's economy / Plain sailing no longer". The Economist. 3 May 2007. Archived from the original on 13 June 2008. Retrieved 9 August 2008. ↑ "Al-Qaeda 'claims Madrid bombings'". BBC. 14 March 2004. Archived from the original on 24 June 2006. Retrieved 13 August 2008. See also: "Madrid bombers get long sentences". BBC. 31 October 2007. Retrieved 13 August 2008. ↑ Bailey, Dominic (14 March 2004). "Spain votes under a shadow". BBC. Archived from the original on 25 August 2004. Retrieved 13 August 2008. ↑ Ortiz, Fiona (22 April 2013). "Spain's population falls as immigrants flee crisis". Reuters. Archived from the original on 2 September 2017. Retrieved 2 September 2017. ↑ Alandete, David (27 October 2017). "Análisis | Is Catalonia independent?". El País . Archived from the original on 28 October 2017. ↑ Piñol, Pere Ríos, Àngels (27 October 2017). "El Parlament de Cataluña aprueba la resolución para declarar la independencia". El País (in Spanish). Archived from the original on 29 October 2017. ↑ "Catalan crisis: Regional MPs debate Spain takeover bid". BBC. 26 October 2017. Archived from the original on 26 October 2017. Retrieved 27 October 2017. ↑ "Catalan crisis: Spain PM Rajoy demands direct rule". BBC. 27 October 2017. Archived from the original on 29 October 2017. Retrieved 27 October 2017. ↑ "Catalonia independence: Rajoy dissolves Catalan parliament". Barcelona, Madrid: BBC News. 27 October 2017. Archived from the original on 28 October 2017. Retrieved 27 October 2017. ↑ Sandford, Alasdair (27 October 2017). "Catalonia: what direct rule from Madrid could mean". euronews. Archived from the original on 27 October 2017. Retrieved 27 October 2017. ↑ "Spain's Prime Minister, Mariano Rajoy, Is Ousted in No-Confidence Vote" . Retrieved 2018-06-18. ↑ Medina García, Eusebio (2006). «Orígenes históricos y ambigüedad de la frontera hispano-lusa (La Raya)» Archived 25 May 2017 at the Wayback Machine . Revista de Estudios Extremeños. Tomo LXII (II Mayo-Agosto). ISSN 0210-2854, pp. 713–723. ↑ World Map of Köppen-Geiger Climate Classification Archived 23 July 2013 at the Wayback Machine , city-data.com, April 2006. ↑ "Spanish Constitution". Senado.es. Archived from the original on 4 November 2011. Retrieved 1 November 2011. ↑ "SPAIN: No Turning Back from Path to Gender Equality". Ipsnews.net. 15 March 2007. Archived from the original on 19 April 2014. Retrieved 5 May 2014. ↑ "Women in National Parliaments". Ipu.org. 28 February 2010. Archived from the original on 28 March 2014. Retrieved 1 May 2010. ↑ "Human Development Report 2007/2008" (PDF). Hdr.undp.org. p. 330. Archived from the original (PDF) on 29 April 2011. Retrieved 18 January 2014. ↑ Fred M. Shelley (2015). Governments around the World: From Democracies to Theocracies: From Democracies to Theocracies. ABC-CLIO. p. 197. ISBN 978-1-4408-3813-2. ↑ "Catalonians vote for more autonomy". CNN. 18 June 2006. Archived from the original on 4 June 2008. Retrieved 13 August 2008. See also: "Economic Survey: Spain 2005". Organisation for Economic Co-operation and Development. Archived from the original on 17 April 2008. Retrieved 13 August 2008. and "Country Briefings: Spain". The Economist. Archived from the original on 14 October 2012. Retrieved 9 August 2008. and "Swiss Experience With Decentralized Government" (PDF). The World Bank. Archived (PDF) from the original on 19 August 2008. Retrieved 13 August 2008. ↑ "La Constitución española de 1978. Preámbulo" (in Spanish). Página oficial del Congreso de los Diputados. Archived from the original on 17 May 2017. Retrieved 8 October 2017. ↑ Spain 2015/2016 Archived 8 August 2016 at the Wayback Machine Amnesty International. Retrieved 22 June 2016. ↑ "Analysis of 8 years of Gender Violence Law in Spain | Gender violence and justice". justiciadegenero.com. Archived from the original on 25 May 2017. Retrieved 9 May 2017. ↑ Rincón, Reyes (25 November 2015). "The successes and failures of Spain's fight against domestic abuse". EL PAÍS. Archived from the original on 25 May 2017. Retrieved 9 May 2017. ↑ "Global Acceptance of Homosexuality". Pew Research Center. 4 June 2013. Archived from the original on 10 November 2014. ↑ "Estatut" (PDF) (in Spanish). Archived from the original (PDF) on 26 March 2009. Retrieved 20 July 2009. ↑ "Nuevo Estatuto de Autonomía de Canarias". .gobiernodecanarias.org. Archived from the original on 20 January 2011. Retrieved 30 April 2011. ↑ "BOCAe32.QXD" (PDF) (in Catalan). Archived from the original (PDF) on 11 July 2009. Retrieved 20 July 2009. ↑ "Estatuto de Autonomía de Aragón". Narros.congreso.es. Archived from the original on 11 December 2009. Retrieved 20 July 2009. ↑ "Unidad de Policía de la Comunidad Autónoma de Andalucía" (in Spanish). Cartujo.org. Archived from the original on 7 November 2007. Retrieved 23 October 2007. ↑ "Tratado de Utretch – Gibraltar (Spanish)". mgar.net. Archived from the original on 10 May 2008. Retrieved 9 August 2008. ↑ "Q&A: Gibraltar's referendum". BBC News. 8 November 2002. Archived from the original on 14 March 2007. Retrieved 19 February 2010. ↑ "Resolution 2070: Question of Gibraltar" (PDF). United Nations. 16 December 1965. Archived from the original (PDF) on 3 May 2011. Retrieved 19 February 2010. ↑ "Resolution 2231: Question of Gibraltar" (PDF). United Nations. 20 December 1966. Archived from the original (PDF) on 3 May 2011. Retrieved 19 February 2010. ↑ "La cuestión de Gibraltar" (in Spanish). Ministry of Foreign Affairs and Cooperation of Spain. January 2008. Archived from the original on 29 May 2009. Retrieved 3 January 2010. ↑ Peter Gold (2005). 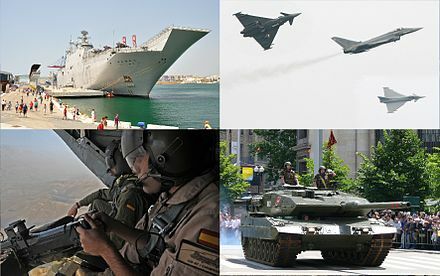 Gibraltar: British or Spanish?. Routledge. p. 4. ISBN 978-0-415-34795-2. ↑ UK Secretary of State for Foreign and Commonwealth Affairs (1999). "Partnership for Progress and Prosperity: Britain and the Overseas Territories. Appendix 1: Profiles for Cayman Islands, Falkland Islands & Gibraltar" (PDF). Partnership for Progress and Prosperity: Britain and the Overseas Territories. Archived from the original (PDF) on 13 December 2005. Retrieved 19 December 2005. ↑ "Spain disputes Portugal islands" Archived 8 September 2013 at the Wayback Machine The Portugal News . Retrieved 9 September 2013. ↑ "Article 62 of the Spanish Constitution of 1978". Official site of the Royal Household of HM the King. Archived from the original on 12 December 2007. Retrieved 13 August 2008. ↑ "Article 8 of the Spanish Constitution of 1978". Official site of the Spanish Senate. Archived from the original on 8 December 2008. Retrieved 29 November 2008. ↑ "Euro area unemployment rate at 11%". Eurostat. Archived (PDF) from the original on 31 July 2017. ↑ "Youth unemployment rate in EU member states as of March 2018". Statista. ↑ Lauren A. Benton (1990). Invisible Factories: The Informal Economy and Industrial Development in Spain. SUNY Press. ↑ Angel Alañón & M. Gómez-Antonio, [Estimating the size of the shadow economy in Spain: a structural model with latent variables], Applies Economics, Vol 37, Issue 9, pp. 1011–1025 (2005). ↑ "OECD report for 2006" (PDF). OECD. Archived (PDF) from the original on 19 August 2008. Retrieved 9 August 2008. ↑ "A good bet?". The Economist. Business. Madrid. 30 April 2009. Archived from the original on 4 May 2009. Retrieved 14 May 2009. ↑ "Spain's Iberdrola signs investment accord with Gulf group Taqa". Forbes. 25 May 2008. Archived from the original on 7 June 2010. ↑ "Big in America?". The Economist. Business. Madrid. 8 April 2009. Archived from the original on 12 April 2009. Retrieved 14 May 2009. ↑ "The lottery of life". The Economist. Archived from the original on 20 July 2014. ↑ "Prize Laureates". leekuanyewworldcityprize.com.sg. Archived from the original on 2012-02-28. ↑ "World Mayor: The 2012 results". worldmayor.com. Archived from the original on 11 January 2013. 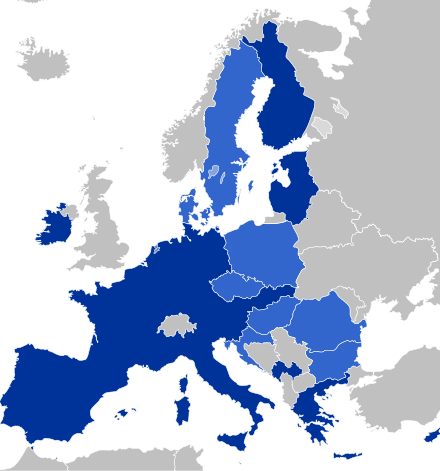 ↑ "European Green Capital". Europa (web portal). Archived from the original on 18 December 2013. ↑ ">> Spain in numbers". Invest in Spain. Retrieved 13 March 2013. ↑ "Spain posts record number of 82 million inbound tourists in 2017". 10 January 2018. Retrieved 10 February 2018. ↑ "Global Guru | analysis". The Global Guru. Archived from the original on 6 January 2011. Retrieved 13 August 2008. ↑ "Economic report" (PDF). Bank of Spain. Archived from the original (PDF) on 26 July 2008. Retrieved 13 August 2008. ↑ Olano, Marisa (25 April 2014). "Renewable energies in Spain". IDAE . Ministerio para la Transición Ecológica, Gobierno de España . Retrieved 6 July 2018. ↑ Morning Edition (15 July 2010). "Spain Is World's Leader in Solar Energy". NPR. Archived from the original on 19 September 2010. Retrieved 4 September 2010. ↑ "Spain becomes solar power world leader". Europeanfutureenergyforum.com. 14 July 2010. Archived from the original on 24 November 2010. Retrieved 4 September 2010. ↑ Villalobos, Alvaro (6 May 2018). "Spain's Bilbao fights to lead European wind power sector". Phys.org (in Spanish). Retrieved 6 July 2018. ↑ AFP (6 May 2018). "Spain's Bilbao fights to lead European wind power sector". The Local (in Spanish). Retrieved 6 July 2018. ↑ "Spain becomes the first European wind energy producer after overcoming Germany for the first time". Eolic Energy News. 31 December 2010. Archived from the original on 27 April 2011. Retrieved 30 April 2011. ↑ "Asociación Empresarial Eólica – Spanish Wind Energy Association – Energía Eólica". Aeeolica. ↑ Méndez, Rafael (9 November 2009). "La eólica supera por primera vez la mitad de la producción eléctrica". El País (in Spanish). Ediciones El País. Archived from the original on 13 May 2011. Retrieved 8 August 2010. ↑ "Wind power in Spain breaks new instantaneous power record". renovablesmadeinspain.es. 9 November 2010. Archived from the original on 14 December 2011. Retrieved 5 June 2011. ↑ Morning Edition (9 November 2010). "14 reactores nucleares movidos por el viento". El País. Retrieved 5 June 2011. ↑ Morning Edition. "La Fuerza del Mar". revista.consumer.es. Archived from the original on 26 August 2011. Retrieved 5 June 2011. ↑ "Algae Based Biofuels in Plain English: Why it Matters, How it Works. (algae algaebiofuels carbonsequestration valcent vertigro algaebasedbiofuels ethanol)". Triplepundit.com. 30 July 2008. Archived from the original on 18 May 2013. Retrieved 19 November 2008. ↑ "Spain to Put 1 million Electric Cars on the Road". Triplepundit.com. 30 July 2008. Archived from the original on 23 November 2008. Retrieved 19 November 2008. ↑ "The Need for Speed–High Speed Rail in Europe: Do You Speak Spanish? Europe on Track". Blog.raileurope.com. Archived from the original on 2 February 2011. Retrieved 1 November 2011. ↑ "Spain has developed Europe's largest high-speed rail network | Olive Press Newspaper". Theolivepress.es. Archived from the original on 10 December 2011. Retrieved 1 November 2011. ↑ "El AVE español, el más veloz del mundo y el segundo en puntualidad". El Mundo. Spain. 10 November 2010. Archived from the original on 9 November 2011. Retrieved 5 June 2011. ↑ "Spain powers ahead with high-speed rail". railpro.co.uk. January 2010. Archived from the original on 21 July 2011. Retrieved 5 June 2011. ↑ "Scimago Institution Rankings" . Retrieved 5 January 2018. ↑ "Population Figures". Instituto Nacional de Estadística (National Statistics Institute). Archived from the original on 24 May 2008. Retrieved 13 August 2008.